One cup sample of eco-friendly petals. Choose from rose, hydrangea, peony, lilac petals or our special blends. ALL grown on our farm in Oregon! "Going GREEN" has never been easier...use our 100% natural eco-friendly freeze dried petals! The World's largest producer of eco-friendly freeze dried petals since 1992! 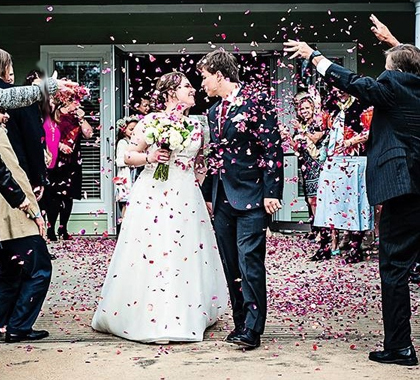 "The elegant effect of Flyboy's rose petals is simply unmatched, dollar for dollar, by any other wedding decoration or accessory." "Going GREEN" has never been easier...use our 100% natural petals! I recently ordered the Something Blue blend and have to say I was a little disappointed. I was hoping to have an even 50/50 mix of white petals and blue petals; however, there was very little in the way of blue petals. The quality and quantity of flowers in the sample pack was good, just would have liked more "blue" in the "Something Blue" blend. I love purchasing from Flyboy Naturals for so many reasons, such as their excellent customer service, and fast and affordable shipping, but most importantly for their beautiful, beautiful petals! I use them for making bath/body products, as well as for ritual, ceremony, and altar offerings, and I send them in kits for my students who are learning to work with flowers in these ways, too. I am especially grateful for the opportunity to buy sample sizes so that I can explore all the different varieties in a feasible way. Sending out a big thank to all who help to make to Flyboy Naturals happen! Beautiful array of dried flowers - can’t beat Flyboy Naturals! I was thrilled when I received our dried flower assortment for our upcoming wedding. They were beautiful packaged, and I loved the flower combination/colors! The ordering was seamless and Jami was extremely helpful I’m in getting the flowers to us on time. I would highly recommend!